Major discoveries in science are often lauded, but sometimes it's the long-running searches that have yet to find anything that deserve the accolades. Now, two dark matter-chasing scientists are being honored for their enduring attempts to track down the elusive stuff, despite not finding any dark matter yet. Physicists Blas Cabrera of Stanford University and Bernard Sadoulet of the University of California, Berkeley have been awarded the 2013 W.K.H. Panofsky Prize in Experimental Particle Physics for their work on the Cryogenic Dark Matter Search (CDMS), an experiment spanning decades that aims to directly detect the particles responsible for dark matter. Scientists don't know what dark matter is, just that it makes up 25 percent of all the mass and energy in the universe. A leading theory suggests dark matter is composed of particles called WIMPs (weakly interacting massive particles) that hardly ever interact with normal matter, and don't even reflect light. So far, no convincing signal of WIMPs has been seen. But the scientists aren't discouraged. 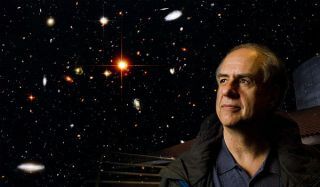 "What it is that makes up dark matter is one of the most exciting questions in science," Cabrera said in a statement. "We are always wanting, just around the corner, to be able to see a signal. We have to have patience and conviction and stick with it, so that's what we've done." The seeds of this project began in the 1980s and 1990s, and over the years the CDMS experiment has been refined and improved. For example, the sensitivity of the detectors has been boosted more than 10,000-fold in the past 20 years, and these detectors have been buried at ever deeper locations to prevent more and more contaminating particles from reaching them. The experiment began at an underground site at Stanford, and later moved to a mine in Minnesota called the Soudan Underground Laboratory. Now the researchers are planning to move the experiments to a deeper site called SuperCDMS-SNOLAB, which is buried about 6,800 feet (2,000 meters) deep in an active mine in Sudbury, Canada. In comparison, the current detectors are buried only 2,600 feet (790 meters) down. Soon, the scientists expect to either discover WIMPs, or rule out their existence altogether. "Bernard and Blas are the Lewis and Clark in the quest for detecting dark matter," said Richard Partridge, a CDMS team member at the SLAC National Accelerator Laboratory in California. "Many of their former students and postdocs are now leaders in the field, and it has been a great experience working with them and following the trail they have blazed." The W.K.H. Panofsky Prize is named in honor of SLAC's founding director, Wolfgang "Pief" Panofsky, and awarded by the American Physical Society. It honors outstanding work in experimental particle physics, and comes with a $10,000 award.